We are curious to know our past. It is always fascinating to know about the evolution of man, how societies changes, how kingdoms and dynasties ruled vast lands and the wars they fought for supremacy, how religious identities have influenced the societies over centuries and many such aspects. The history leaves behind its visible mark in the form of ruins, excavation findings, forts, palaces, temples, churches, mosques and other heritage structures. Visit to these historical and heritage sites is a fascinating experience. It enriches our knowledge of our past and gives us an insight into the linkages of the past with the present and lessons for the future. Khula Aasmaan urges children and young adults to visit historical and heritage sites and submit your entry to Khula Aasmaan. 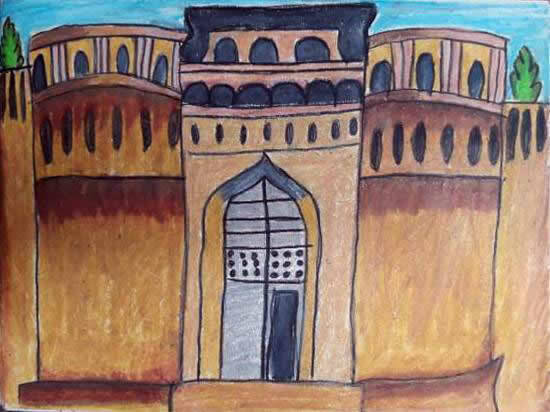 Children (5 to 15 years) can submit Sketches & Drawings, Paintings, Cartoons, Collage. Young Adults (15 to 25 years) can submit Sketches & Drawings, Paintings, Cartoons, Comic Art, Posters, Doodles, 3D Art on paper, Photographs (camera and cellphone), Digital Art (any artwork created using digital tools). Khula Aasmaan will create and update resources and information relating to history and heritage sites. This will help children, young adults and their families in exploring the rich legacy that we have inherited.